Two more weeks until the spring semester starts and my books have been purchased. I had to decline a couple shoots for the month of February because I want to make sure I get familiar with my courses before I get back to shooting and casting. It has always been helpful to understand the expectations of my classes before handling additional tasks. This past week, I decided to give my head a rest and take out my weave. It’s been a couple months since I’ve seen my natural hair and I miss it. My regular “model look” is long hair with bangs and I believe that models should be able to possess multiple looks and morph into different characters – just like actors. I love it when I see the same model with different hairstyles. It just shows the strength in their face and their ability to pull off any look. That is where I want to be. However, it has been pretty difficult to achieve this because of the standards of different agencies and clients. 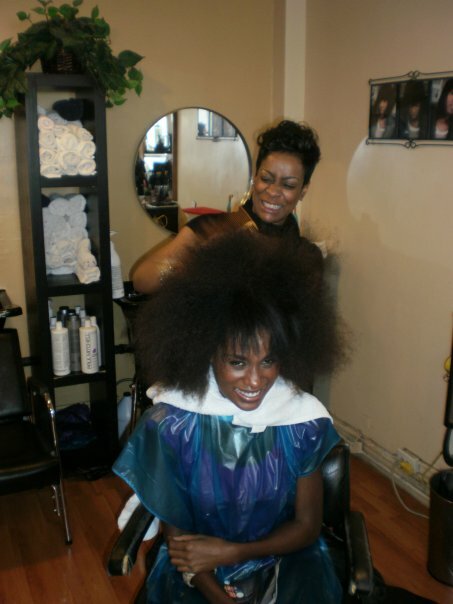 It’s also difficult when working with hairstylists that are unfamiliar with African American hair. So why is it that some agencies/clients prefer you with just one hairstyle over another? It seems as though models of a different race have the ability to do so much more. I remember when I went to my very first agency in San Francisco. At the time, I was wearing extensions and the booker said that they do not like black girls to wear weaves. However, the agency I’m with now prefers me with longer hair. I realize that opinions differ, but if look at half the make-up ads featuring black models, most of the time they are rocking a variety of hairstyles. Some have weaves; some relax their hair and others have afros and braids – all represent our culture. The hair issue can be draining but this year is going to be a good change for me. I want to try new things and do more creative work. Whether you’re a booker, casting director, stylist or photographer, you have to be able to adapt to change. The industry needs it.